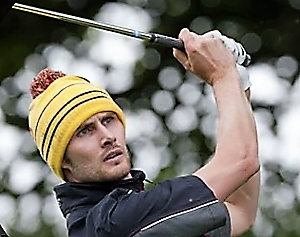 Michael Patterson (Kilmacolm), pictured, won the top individual pro prize of £200 with a five-under-par round of 66 at today's Ayrshire Winter Golf Association pro-am at Glasgow Gailes Golf Club. score of 57, which earned Patterson another £80. 66 Michael Patterson (Kilmacolm) £200. 67 Fraser McKenna (Caldwell) £135. 67 Stephen Gray (Airdrie) £90. 67 Paul O'Hara (North Lanarkshire Leisure) £55. 70 Paul McKechnie (Braid Hills Golf) £45.